why mix media? why not stick to just one as in 'pure' watercolour? During the talk I gave at the sketchclub on sketching and sketchbooks, we also talked about using mixed media. 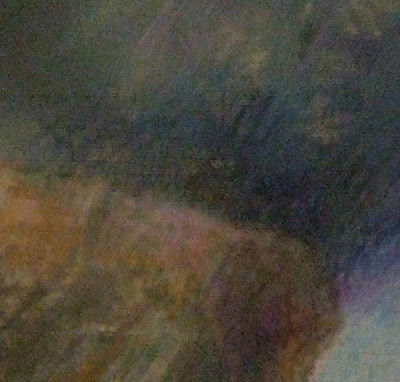 Some people beginning painting imagine that if they use for instance, watercolour, then they must use only watercolour - or at the most pen and wash. There is a perception that this is more 'pure'. 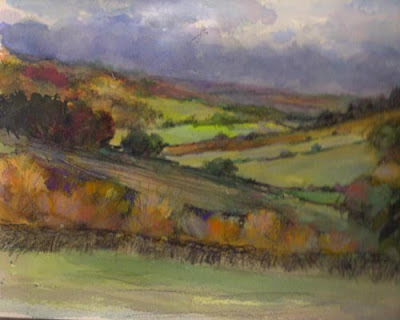 This plein air sketch was done on a day of clouds and sunshine - a sudden flash of sun lit up that line of trees and a distant field and I was able to put the glowing colour in with pastels over the darker colour of the paint - a few minutes early they had been dark and gloomy. Not the first mixture you'd think of - but I really liked the way the pastels and charcoal related to the oil paint. 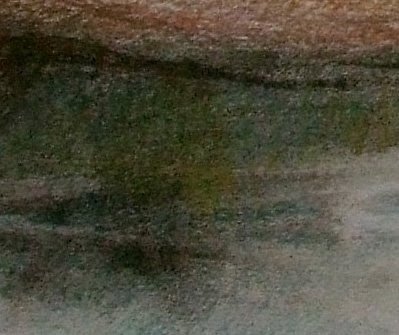 Below is an experiment with an underpainting of the beach at night done in a mix of ultramarine and raw umber acrylic paint with soft colour added with polychromos and Lyra coloured pencils, keeping the underlying blue/brown greys coming through. below: Again sketching plein air on a drizzly, misty day - this one used watercolour, coloured pencil, ink, tippex, chinagraph pencil and oil pastel - and it's only about 6 inches square! I needed to work fast as I was with the family and this mix allowed me to get down what I wanted fast. I've used coloured pencils along with watercolour for a very long time but only recently started experimenting with using it alongside so many other media - I've recently been discussing with Gayle http://pencilsbrushesdogsandcats.blogspot.com/ the way she uses glazes of acrylic over coloured pencils - something I mean to try out soon :>) - do look at the beautiful results she achieves with this technique. I was about to say that I don't do mixed media, but I do use indian ink with watercolour, or watercolour pencil. And I do work oil pastels over coloured inks. I keep meaning to stick with one subject and try it out in a series of mediums. The thing with mixed media, is that I don't know where to start. I'll look at a scene and think 'that'd look good painted in ink, or in soft pastels' but my head can't seem to mix the two. How do I start? The story of your Beacon Hill sketch is a great example of mixed media use, Vivien. It was really your work that convinced me it was okay to add other elements to watercolour - I have no idea why I was so hung up about it. I did wonder just how much kit you were carrying when you did that little Cornwall sketch. Every one of these paintings excites my eye. Very lovely (as usual). Because I like to take lots of stuff I like it best if I can park nearby! It's such a good idea to promote the idea that mixed media is good. I really enjoy mixing pen and ink and coloured pencil - but I ought to try doing more watercolour and pastels too. 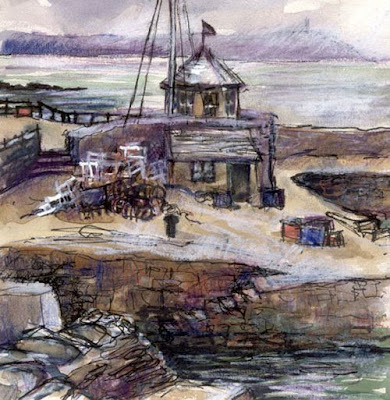 Yes I'd love to see you do some watercolour/pastel work Katherine as you've done some beautiful pastels in the past. Vivien, your work is simply excellent--everything you do is of the highest quality. It's frustrating for me at this point, as I work on my water theme, because I won't let myself look at your blog very often. I don't want to see the kind of solutions YOU'VE come up with and have them influence me! Just know I'm a big, big fan ;D.
well that's just made my day :>D thank you! Great post, Vivien - I love the photos and close-ups. My use of watercolours is decidely poor and needs some practicising but I wholeheartedly agree on the uses of various media. I liked what you did with charcoal and coloured pencils. 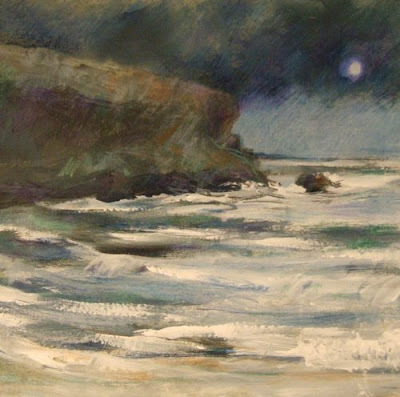 I think I'm still rather hesitant on charcoal but that coastline works really well. 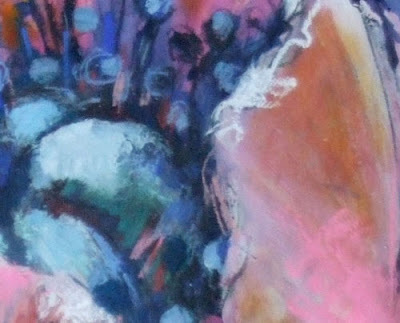 I think changing the 'usual' order is really useful too, just as you describe with the oilies underneath watercolours. I must admit I sold my CP set after I hadn't used it for a year... but maybe there's time for a new one. I hope to be doing some more pastel work soon, and since discovering de Stael's black sky (last post of mine) I may be more experimental with using black (charcoal) for my own work. Mmmm… Loving the mixed media detail picture at the top. 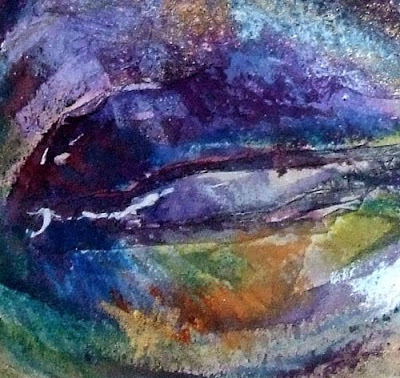 It looks like an extremely close–up and abstracted eye!